At 30kg for a Tirfor and cable, they could live in the syncro permanently. Whilst I can see the technical appeal in fitting a powered winch, I will admit that the more I read and think about it the less I like the idea. Its a lot of money (realistically circa £1000 for a hydraulic system) that could be far better spent. silverbullet wrote: At 30kg for a Tirfor and cable, they could live in the syncro permanently. Looks cool though, which quite frankly is the most important thing right? ha ha! I cant believe you can buy this stuff off the shelf with no formal training though (obviously policing that would be impossible)... but all of this kit strikes me as very dangerous and in the wrong, untrained hands, deadly. Is the fact you can 'get out of the way' while operating a vehicle mounted winch not a big positive factor? With the Tirfor, you are right in the middle of everything - bad if something goes wrong. I'm no expert on the matter but when I was looking into whether a hydraulic winch would be a viable, the best option for the hydraulic pump would be a twin belt pump with a 12V electro magnetic clutch. They offer high flow, high pressure and minimal engine load when not activated, this one offers 58.5 litres per minute at 210 bar http://www.ebay.co.uk/itm/Flowfit-Hydraulic-Electro-Magnetic-clutch-amp-pump-12V-14daNm-58-5-l-min-ZZ000450-/310531905487. It would satisfy the WinchMax recommended flow of 50-60 lpm but the pressure is a little on the high side but I'm sure there'll be variants, it's not cheap at £400, but then again nothing hydraulic is, plus you'd have to add a filter and a reservoir. The question of whether to use a PAS pump to power a hydraulic winch is repeated over and over on the off road forums and all seem to respond that they are mind numbingly slow and day will turn to night before you get yourself out. So, I spoke to a guy at work... Ex army and now heads up Kent Search and Rescue. He has used Tirfor winches 100s of times and can't fault them. He has never seen one go wrong and has winched tanks out of some pretty stuck places. So they are becoming more appealing in my eyes. So, the next thing to think about is whether a T-Max version of a Tirfor is any good? Cheap compared to a new tirfor. Good find John, the pump is definitely key to making a hyd.winch perform well, from what I have read. Add that to a £600-700 winchmax or a £900 milemarker and it all gets very silly. If I needed to use up some business CapEx tax allowance I might just think about it, but there are better ways to waste money on tools that I will rarely use! * the occasional use means that the slow pull of a manual winch is not too much of a disadvantage. There is one option which has not been discussed here and that is to make use of the hi-lift jack. There are many online videos demonstrating the technique - here's a couple of examples - https://www.youtube.com/watch?v=pAGp8lizSQU & https://www.youtube.com/watch?v=OKTwlp3Nl1Q. Many of them recommend using chains but these are heavy and, in my opinion, not the best thing for recovery. I suspect that most syncro drivers who consider they may get into a situation that requires winching will already be carrying a hi-lift, so no extra weight for that element. Add to that a few extra bits and a long length of suitable rope and you're ready to go. There are a couple of different ways the technique can be used. If you have a stretchy rope (nylon?) you can build up the tension in the rope using the brakes if necessary to hold the vehicle until you are ready to use the 'spring' to help you attempt to drive out of the situation. If you need a longer pull than just one length of the jack can provide then try using prussic loops to hold the tension in the main rope while you back off the jack and take a second bite.http://www.instructables.com/id/Tying-a-Prussic-Knot/. Use one prussic loop to attach the rope to the jack toe and a second one to attach it to the base of the jack standard. 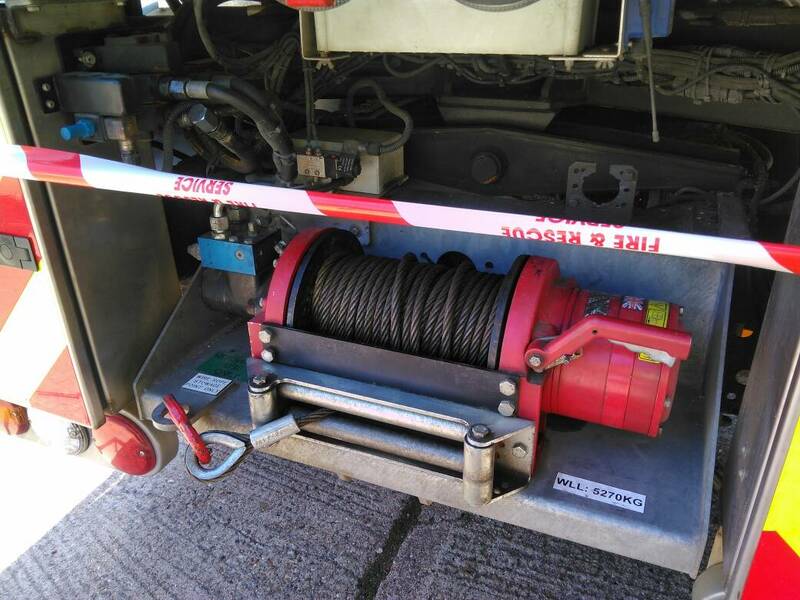 When the jack reaches maximum travel, slide the second prussic knot as far towards the vehicle as possible then back of the jack to transfer the load onto this loop/knot. Now the first loop will be slackened off and can be slid right down to the second knot as the jack is 'lowered'. Then it is a case of repeating as often as necessary. Just another option for your consideration. With regard to using a HiLift jack as a winch, I have seen some comments on the Expedition Portal that suggest this is really slow, and doesn't really work well unless you have one of the taller 60" jacks, as it can take a little time to get sufficient tension in the system to start pulling, by which time you've run out of upright. I'm not sure whether this is the case as I've never tried this technique - it's just what I've read. The mechanical rack and chain is just a fancy word for a humble old high lift jack. This procedure only works with a chain, no rope or strapping must be used. The chain is attached to the stricken vehicle and to the jaw on the high lift jack shuttle - leave about half a meter free at this end. The high lift jack rack is chained to a rigid anchor point. When the handle is operated, the stricken vehicle will be moved towards the anchor point. When the full length of the rack is used up, take the half meter of loose chain you left loose and bolt it to the anchor chain, then remove the connection on the jaw (The link to the anchor point will keep the vehicle stationary) and move the jaw back down the rack. Now refit the chain to the shuttle jaw and repeat the operation. Very slow, tedious and exhausting. This is a lot of hard work but as long as you are alive and vaguely fit, you can retrieve your vehicle from anywhere in any conditions without the use of engine, battery or other means." Last edited by silverbullet on 19 Oct 2017, 16:32, edited 1 time in total. From my military experience in various places and weathers all over the world from land rovers to tanks, a decent set of recovery strops and shackles have usually done the job, they do require another vehicle but you can use them solo with a tirfir or using techniques like pendulum ing round a tree to get out of ruts. The only time we use winches is when the vehicles are properly stuck, think completely sank, or extensively damaged and then the pros come and do it for us with significantly heavier kit than we could carry or use safely. Incidentally all our steel ropes are 'dead' and do not recoil when they break under tension. We extensively teach 'self' recovery I.e a tow from another vehicle, most of which revolves around prior route selection, digging and always try to pull out the way you went in. You can always shackle strops together for a longer pull or daisy chain vehicles for pulling power. As for vehicle anchor points, we don't use towing sockets they're designed for towing. the vehicles have recovery eyes built in somewhere, like land rovers have four, one on each chassis rail front and back which are capable of taking the high forces in various directions. When I think about it most the vehicles I can think of have four recovery eyes and the all come off the chassis rails. I've opted for the hi-lift with their winch kit. This also needs a length of chain and some form of straps or rope to make up the distance to the nearest anchor point. I'll have a play about with chain lengths to get this down to a minimum and make up the overall length with a 40m dyneema rope. This is light and wont take up much space inside the vehicle. This will allow pulling from any direction. 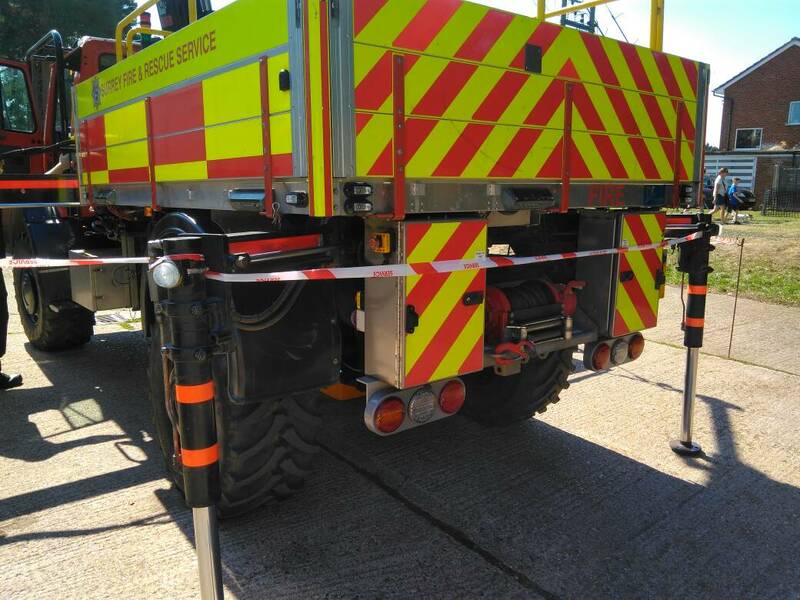 The hi-lift also allows lifting of a single wheel with another attachment that they make creating a solution to place waffle boards or similar under the wheels to aid recovery. I would rather have one tool that can do many jobs than be restricted to a front mounted winch that may not be as versatile. I clocked the winches, this is the rear unit. Superwinch, hydraulic, made in UK.